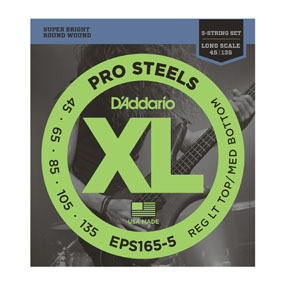 EPS165-5 is the 5-string version of the most popular D’Addario hybrid bass set which combines the high strings from an EPS170 (.45 and .65) with the low strings from an EPS160 (.85 and .105). With the addition of the .135 Low B string, this set is optimal for players looking for the ideal combination of biting high end, punchy lows and super long life. Fits basses with a string scale length of up to 36 7/8 inches.